Today is national pumpkin day which is quite fitting because you can’t seem to go anywhere without pumpkin being on the menu. 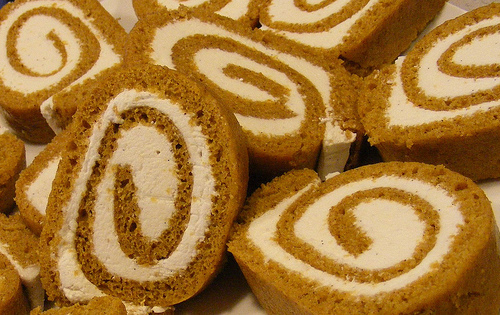 To celebrate we made a pumpkin roll and created a video on how to jazz up all of your pumpkin recipes. PREHEAT oven to 375° F. Spray 15 x 10-inch jelly-roll pan; line with wax paper. Spray and flour paper. Sprinkle a thin, cotton kitchen towel with powdered sugar. BEAT cream cheese, 1 cup powdered sugar, Kelapo Coconut Oil and vanilla extract in small mixer bowl until smooth. 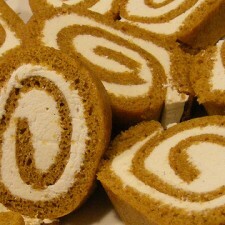 Carefully unroll cake. Spread cream cheese mixture over cake. Reroll cake. Wrap in plastic wrap and refrigerate at least one hour. Sprinkle with powdered sugar before serving, if desired.